Situated near the base of the Istrian peninsula, the population of Pula stands at just over 62,000 making it the largest city in Istria. Its most famous attraction, the well preserved Roman amphitheatre, is one of the most famous sights in the whole of Croatia. Pula has an international airport, with a number of flights from the UK and Ireland and other cities in Europe to there – see our Getting to Istria page for details. You can use the Brioni / FILS shuttle buses to travel from the airport to the main bus station in Pula. You could also fly to Trieste and then get a bus to Pula, or fly to Venice and either get a bus or a catamaran to Pula. Although the amphitheatre in the town announces Pula’s Roman origins, its history in fact stretches far, far beyond this period. 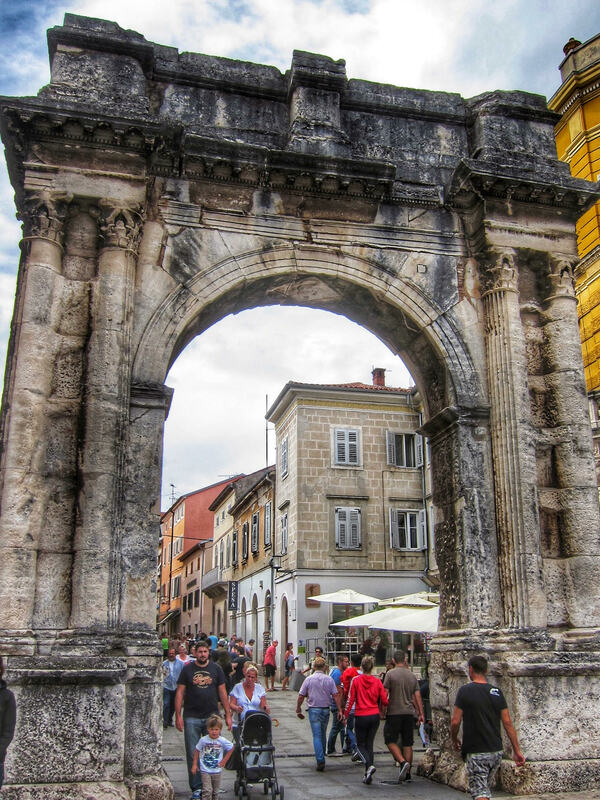 Archeological findings in the area suggest that Pula’s history stretches back to 40,000 or even 1 million years BC! It was however in the 11th century BC that Pula rose to prominence when it became a major settlement for the Illyrian tribe the Histri. After expansion by the Roman Empire into Istria in 177 BC, in 40 BC Pula became a Roman colony and grew rapidly during the years 27 BC to AD 14 under Emperor Caesar Augustus. During this time several important buildings were constructed (including the amphitheatre) and the town rose in strategic and economic significance for the Romans, with local trade becoming rather important. As with the rest of Istria, Pula fell under the control of the Venetians in 1331 and at the time the town had both strong Slavic and Roman influences. In was under Venetian control that Pula unfortunately suffered from numerous plagues and attacks from other groups (the Habsburgs, for one) and its population dwindled – by the 16th century, there were only 1,000 citizens (down from 5,000 in the previous century) and by 1631, only 300 people lived there. Pula finally recovered in part during the 19th century when, now in the Austro-Hungarian Empire, it was proclaimed the chief port of the Empire in 1853 and the population rose once more as industry grew and workers flocked to the town. Around this time, Pula had a large German and Italian population. After World War I, Pula (and Istria) became part of Italy and the majority of Croatians suffered oppression during this time as their rights were not respected. After World War II ended in 1945, Pula was administered by the United Nations and British and American units. It finally became part of Yugoslavia in 1947, and was then part of Croatia when it declared its independence in 1991. 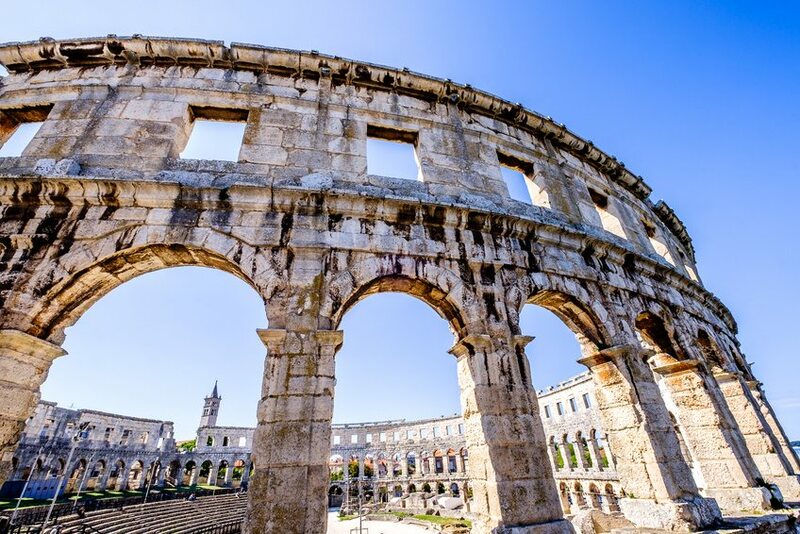 The most famous sight in Pula – of course – is the Roman amphitheatre, which is called The Arena. Built during the 1st century AD and completed under the reign of Emperor Flavius, this amphitheatre is the sixth largest in the world (of those that still exist). The three-storey structure held 23,000 spectators in Roman times and today hosts numerous concerts and events throughout the year, including Pula Film Festival screenings. The opening concert of the Outlook Festival also takes place here. The Temple of Augustus (Augustov Hram in Croatian), was built during AD 2-14 in honour of Emperor Augustus. It stands at a site next to which there was also an accompanying Temple of Diana (of which only a very small part remains). The Temple now contains Roman sculpture. The Forum, where the Temple of Augustus stands, was once the main square in Roman times and is still a bustling piazza today with its many cafes. 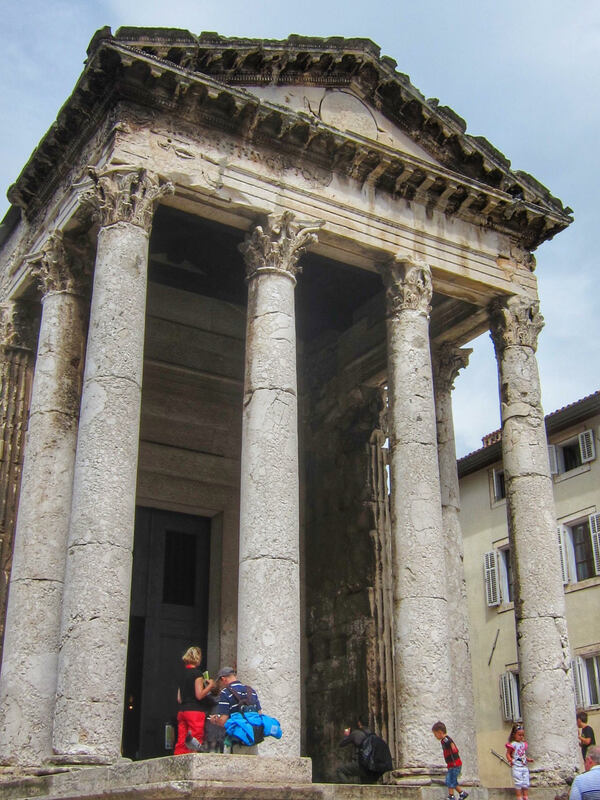 Hercules Gate (Herkulova vrata in Croatian; also known as Porta Ercole) is the oldest standing Roman monument, dating from the 1st century BC. There is also a hop-on/hop-off sightseeing bus run in Pula during the summer months. The bus operates an audio tour in numerous different languages, and stops at the main sights in town. For more details, and to see a map of the route, please see the official website: Pula City Tour. A three-hour bike tour of Cape Kamjenak (south of Pula) is an ideal way to spend part of your day in this region! This family-friendly tour takes in the gorgeous coves, bays, beaches and beautiful waters of this nature park. Author James Joyce stayed in Pula for five months from October 1904. He came to Pula to teach English to Austrian officers at the Berlitz language school. Despite calling Pula a “naval Siberia”, he is thought to have written part of his first novel Stephen Hero there, was well as working on his classic A Portrait of the Artist as a Young Man. A bronze James Joyce now sits at Uliks (Ulysses) cafe in Pula. Italian poet Dante Alighieri mentioned Pula in his Divina Commedia. The Pula Film Festival is one of the oldest film festivals in Europe, and over the years has attracted glamorous acting greats such as Elizabeth Taylor, Richard Burton and Orson Welles. See our special Accommodation in Pula page. The area code is 052. Pula Tourist Office is situated at Forum 3, tel: 052 219 197, fax 052 211 855, email: info@istria-pula.com. For more on Pula, point your browser to the Pula Tourist Office website, or the Istria Tourist Board’s section on Pula.